LEGENDARY LEAKS: What Just happened? – SKREEONK! LEGENDARY LEAKS: What Just happened? Afternoon everyone – Jon @ UnCanny here. If you’ve got a pair of eyeballs and have surfed the web anytime in the past four days I’m willing to bet you’ve seen the leaked sizzle reel for Legendary’s GODZILLA. If you’re really sharp – you caught the leaked ‘trailer’ for the film last night at about midnight. You read that right. Not one – but TWO teaser trailers of sorts have leaked online within the span of the past four days. And it has been quite the ride. First things first: The initial footage that leaked (you know, the one minute and thirty seconds of sombre awesomeness that took the internet by shitstorm earlier this week) made its rounds as an official “leaked trailer”. This is false. Most of us fans are completely aware of what this footage is, but for those who are not lets make a few things clear, yes? ^We’re all familiar with this image, it leaked right after Gareth Edwards and team showed their proof-of-concept reel at the 2012 San Diego Comic Con. Well, in a sense that statement holds true. The image above is actually a screen grab from the recently leaked footage – hence it is a much clearer version of the originally leaked photo that hailed from Hall H. 1.) We may not see any of the footage in this teaser within the actual film (including the giant six-legged red beastie). 2.) This footage was all compiled and rendered very early in production – and may not represent Godzilla’s final design, etc. So yes, the concept reel was incredible – and it was amazing to see exactly why the clip stole the show at last years SDCC. But no internet, it is not a leaked trailer. Either way, this leaked concept reel gave us another look at Goji in motion – AND let us hear what direction they’re going in with his roar. Now we’re not going to post anymore versions of the teaser or Goji’s roar that may still be hiding in the corners of the interwebs (because copyright infringement is never your friend) but I will tell you that Edwards and Team have settled on a roar that is rather jarring – which is good. Godzilla’s cry starts out very high pitch and forward – more of a piercing skreeonk than a trumpeting call. The tail end of his roar (digging all these puns yet?) is where the real power rests – the high pitched skreeonk falls into a deep, wail-like cry that fulfills the “trumpeting” nature of Godzilla – and makes him sound very real, and very large. Honestly I hope they tweak the beginning of the roar a bit – it reminds me way too much of GINO/Zilla. The end of his roar, however, is very reminiscent of the original Gojira’s tangible bass-lined cry. But wait, what about this ‘giant six-legged red beastie’ you mentioned, Jon? Ah, yes. The so-called “Centipede Monster” we all heard so much about last year finally comes to light. And he isn’t much of a centipede at all, really. My God… what is this monstrosity? Six monitor lizard-like limbs with burnt red, komodo dragon-esque scaly hide? A snapping turtle tail and… and a shell? Or is that an Anguirus-like carapace? CENTIPEDE!? No.. no what… What the hell is this thing? The first was compiled by BS Digital Q over at our partner site Kaijuphile. It gives us a clear look at the full creature, ‘shell’ and all. Click the images (any in this article) for full size display. Odd, yes? This just makes the creature even more baffling. The image above is a compilation of the entire sequence in which the concept reel pans across the monster’s charred corpse – so it is a bit skewed. 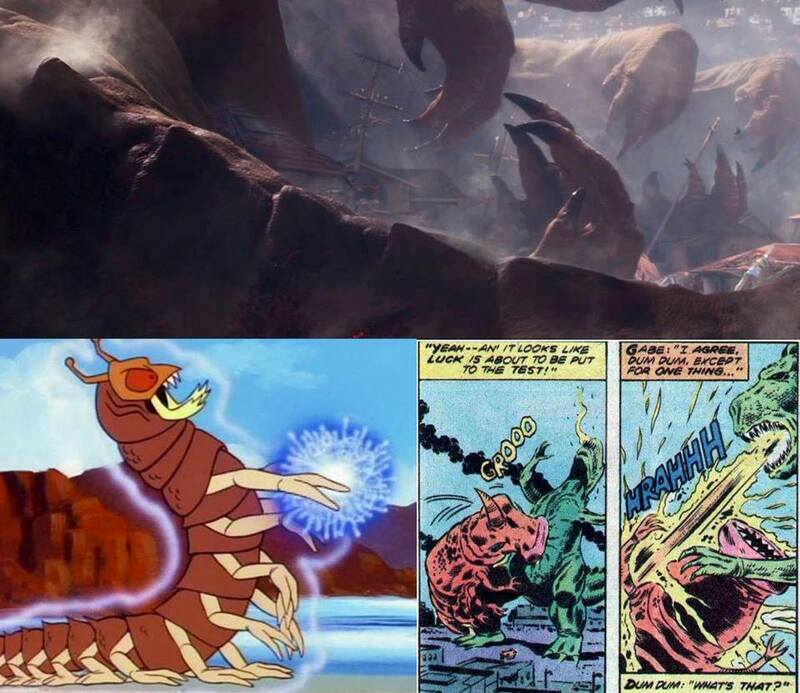 Personally I do think that, as previously stated, we won’t see this creature in the final film – and he was simply created to coincide with Oppenheimer’s “Multi-Armed Form” portion of the WWII quote they used. Something to consider. We’re here to argue that its been done even more than twice! 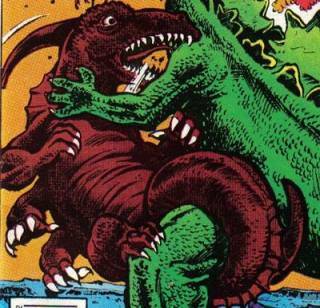 Toho Kingdom user Godzillakuj94 pointed out that the creature also bares resemblance to another of Marvel’s Godzilla creatures – Ghilaron (seen to the left). I honestly do not believe we’ll be seeing a reincarnation of these monsters next year – but at this point we honestly don’t know what to expect. It is fun to speculate, however, and see just what might have influenced their decisions for the new creatures within the film. Remember, Edwards did explicitly state that the Kaiju other than Godzilla would be new beasties. Whatever the other creatures end up looking like – I really hope they’ve got a unique, iconic look to them; Something we’d have fun adding to our rogues galleries or buying a vinyl figure of. Now what of this other trailer that hit last night at midnight? To jump right into it yes, it was legit. The new trailer opens with a recognizable voiceover by David Srathairn in which he is coaching a group of storm-trooper/hazard zone soldiers before a halo jump. This confirms that Strathairn will be playing a military commander of some sort within the film. The halo jump is filled with powerful imagery – the soldiers freefalling blindly into dark clouds of smoke as their flares leave trails of red gas behind them. The shot opens up to reveal the jump’s destination – a desolate and apocalyptic cityscape – smoking, skeletal remains of a once flourishing human civilization. From there the trailer goes bezerk and becomes what we typically expect of a Hollywood sizzle-reel. Clips of the entire cast flash across the screen: Most notably Bryan Cranston in full hazard gear, Elizabeth Olsen in a emergency shelter, and Aaron Taylor Johnson rising just in time to have the train/subway car he is riding in ripped to shreds by an unknown force. The presence of the main cast solidifies this ‘trailers’ authenticity not just by their presence – but with the fact that all of this footage is brand new and does not exist anywhere other than within this leaked footage. 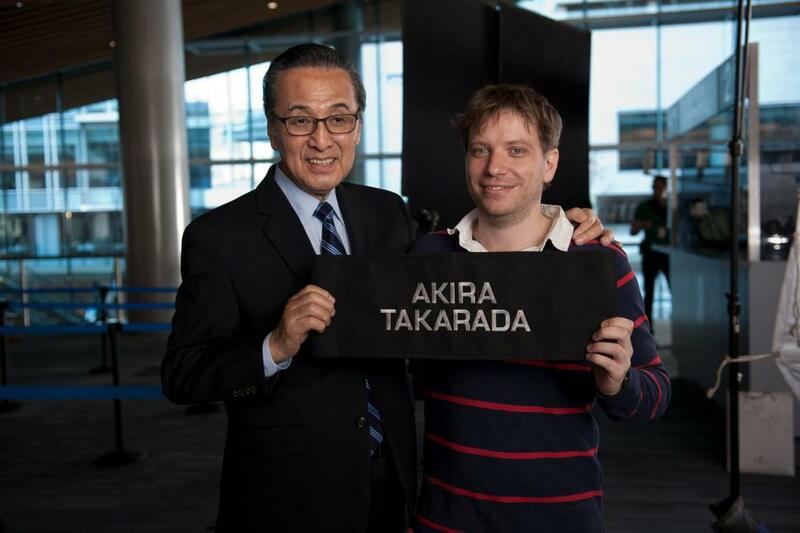 Furthering that point is the presence of several recognizable locations from which we saw previous leaked/official images from on set – including the train Johnson is on and the Japanese airport in with Akira Takarada filmed his cameo (seen above right). More interestingly is the presence of clips from the previously discussed SDCC concept reel. The leaked trailer ends with the exact same debris-filled reveal of Godzilla we all now have etched into our minds forever. Several other scenes from the SDCC piece are peppered throughout – including the gruesome scene in which a mangled train lays amidst dozens of bloodies corpses, and the iconic “hole in building” shot. Godzilla-movies.com has some great grabs of both of these scenes, which you can see below. I do hope the latter doesn’t make it into the film, as it was basically taken straight from the 1998 Godzilla film. What makes all of this so fascinating to me is that I only watched the leaked trailer a handful of times last night (maybe four at max) – and I remember all of this. I haven’t had to rewatch or research said trailer to write this article – and even as a fan that is impressive. It means that they did a superb job assembling what clips they have so far. Just to be clear, that is exactly what was leaked – clips. The footage is clearly meant to be a trailer, but is not finished by any means. Hardly any music was present, and the footage was spliced – not seamlessly cut. I am also quite thrown by the shots being recycled from the SDCC reel – I don’t think we’ll be seeing most of them in a final trailer. Something tells me the now infamous shot of Goji rising through the dust and debris will be around for a good while though – and rightfully so. The entire trailer was of a similar ambiance to that clip – a sort of atmospheric weight highlighted in tans, grays and reds. I think it is safe to say that we can now be sure that Edwards is delivering on his promise to return the King of the Monsters to his 1954 roots – and to have this be the “hyper realistic version of the fairy tale we all witnessed in the 1954 film”. One thing is for certain, I cannot wait to see the final trailer. Speculation points to it being released with WB’s upcoming The Hobbit: Desolation of Smaug in theaters. If this is the case I could not be more excited. I am an immense fan of Tolkein’s work (have Thorin’s Key and The One Ring hanging by my desk in front of me now) and to see the trailer for Legendary’s GODZILLA within the same theater as the next Hobbit film would just tickle every fancy I have. Actually, I think this new creature looks pretty cool (using my imagination to fill in the blanks)… and I must add that I don’t think this creature will look anything like that comic-book creature. My reasoning: look at the thumb posture on the creature. The thumbs are facing upwards (toward the camera). I feel that the thumbs are placed on top of the hand, facing the upper body- meaning the head and neck is the closest to the frame. WE ARE LOOKING AT THE TOP OF THE CREATURE’S HEAD. The ridged neck (similiar to ’98 Zilla) fades back behind the shell…. my guess: this is a cross between a “centipede”-like creature mixed with Gamera. I think this could look awesome! (not stating that I believe it will be included in the movie). But thanks for the article! Before reading this I had not yet realized that that is a shell! Pingback: A Godzilla podcast for Godzilla fans, Kaijucast » Blog Archive » 10.12.2013: Dave Filoni & the Head of Mechagodzilla is the only podcast dedicated to Godzilla and all of his rubber-suited foes. Actually Jon the “hole in the building” goes back to 1984’s “Godzilla” where the Super X attacks through a hole in a skyscraper! Very true my friend – and thats not the only Toho film to feature the image, either! American audiences will definitely associate it with the 1998 film, however. Next Post Skreeonk LIVE! Episode 4: Kaiju Video Games and Being a Kaiju Fan! Previous Post The Kaiju Fan Network Forums are LIVE!